Ok, slight cheat - it's the 2nd day of the month. Does the fact I did my back in yesterday give me any grace? Early February in the front garden. After January being so mild for most of it, the sudden cold has slowed things down a bit. However, compared to the greyness of January's post, the lovely colours of a cold and sunny February makes it worth it. Not a lot has changed, other than the broad beans I planted in the right side bed have sprouted where there were nowhere to be seen in January. I also have the leaves of various bulbs coming up, muscari and crocus, as well as some of the garlic. And the Iris leaves, which never completely died off this winter (unlike the previous year), are standing to attention and getting read to put on exponential growth the moment it gets warmer. 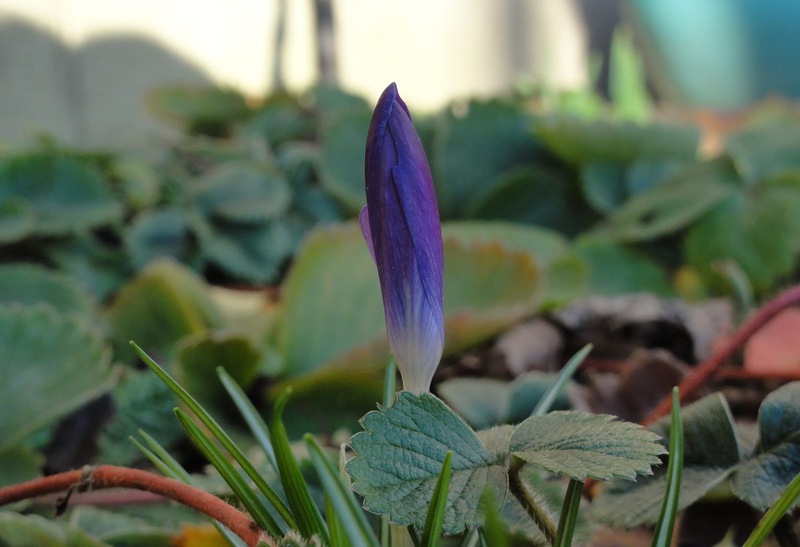 The first colour has arrived in the guise of one lonely crocus flower. Not even open, thanks to the freezing temperatures of the last few days. But that just makes it more welcome, more of a delight. Despite the weather it's keen to get outside and do its thing. Now we wait to see if February remains cold and therefore growth is slow. Or will it suddenly warm and bring out not just the crocus but all the daffidol and narcissus flowers, but also the green growth of the fritillaries? That looks lovely; I really admire people growing food in their front gardens. 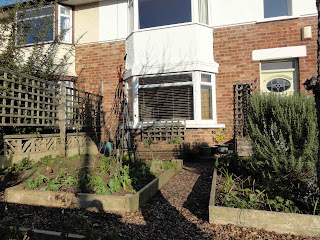 The most we have managed is herbs and our new front garden is even smaller - I'm constantly dropping hints about how convenient it would be to put a wigwam of peas or beans for seed saving out the front, for isolation purposes. So far I've managed to win the idea of sweet peas along the side of the house at least! We are going to install some raised beds in our new, small back garden (to keep it tidy and discourage the dog from picking her own carrots); not happy about all the preservatives on some of the wood available we are going to install some untreated larch, fully aware it may not last more than a season. Yours look great - may I ask what they are edged with and how long they've lasted so far? Very nice blog and super pics. Iv'e just linked from my blog to yours. Keep up the good work, hope your back is back!! 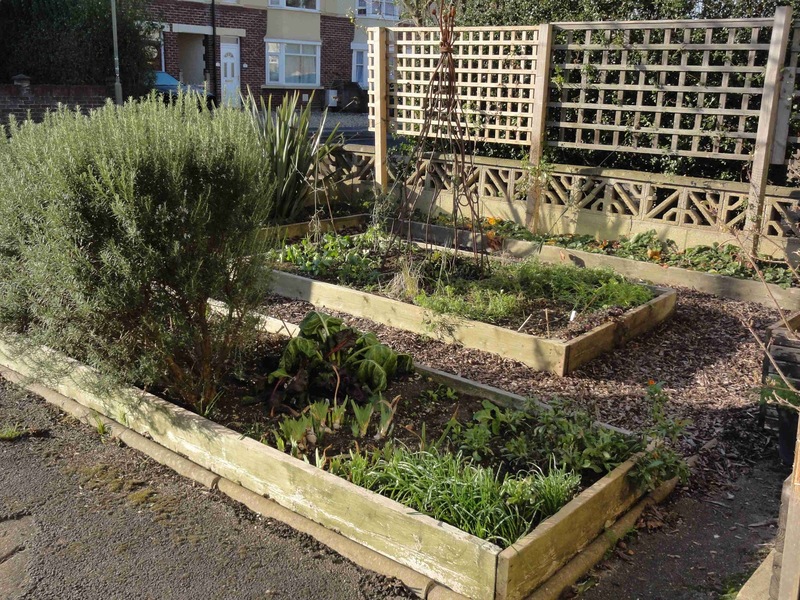 Vanessa - I'm very keen to encourage people to grow veg in their front gardens. It's a great way of maximising limited growing space and you get to chat with neighbours. To help convince, focus on things like the coloured chards and purple podded peas - which look pretty as well as being edible. 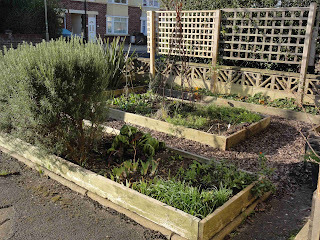 My raised bed borders are old scaffold boards, which aren't treated so no problems with chemicals. I put on some eco-preserve stuff too, to help extend their life and so I could make the 'match' so it looked a bit more designed. They are two years old now and I'd say they have a lot of years left in them. Very please with them, and they are really tough too. I got them from Oxford Wood Recycling. There probably is something like that down your way. Thanks for the reply; I think coloured podded things will be the way to go, if I can get permission/cooperation/24 hours to do it before anyone else notices! 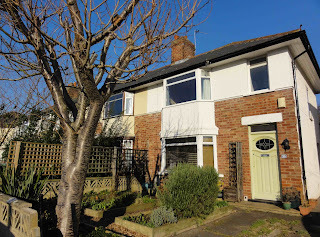 Your boards certainly do look like they have a way to go - I believe I read about something like that organisation in Permaculture magazine a couple of issues ago. May they have many more years of life and growing ahead of them!